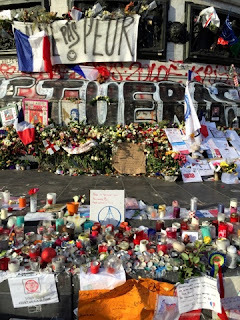 It has been four weeks since the Paris attacks and it is only now that I can say our lives have started to get back to normal. Whatever our interpretation of "normal" is anyway. Tonight for the first time since the attacks, Frenchie and I went out after we both finished work. We walked into an old Parisian bar in the 3rd arrondissement, not too renovated nor modern nor hipster and perched ourselves at the counter. It was apéro time, drinks and a platter to share on a Friday night after finishing the working week. Across the bar we could see the delicate slices of chiffonade jambon being shaved and falling ever so gently onto our plate from the machine, the old fashioned way. It felt nice being there. It was the first time we'd gone out at night to a bar since the attacks. It felt like life was finally getting back on track. It felt like time to write this post. It's taken me a long time to actually sit down and do this. While writing is normally a therapeutic exercise for me, this time was an exception, I felt a little, paralysed. I had too many questions, emotions, thoughts and feelings of disbelief running through my system. I was in need of intense discussion and analytical debate not quiet reflection and personal writing. I admit I have spent the last few weeks poring over article after article and researching non-stop to try and understand what the hell brought these shocking events to fruition. I have watched too much of the news and talked to virtually all of my friends, family, colleagues, students and clients about this issue trying to come to terms with the scope of it. I will always remember the exact moment when I found out about the Paris attacks. I think we all will be able to pinpoint the time and place and recall exactly what we were doing when we learnt of this shocking event on Friday the 13th, November 2015. Frenchie and his daughter were sat on the couch watching the France vs Germany football match on TV. I was exhausted from a long week at work and had dozed off for a quick cat nap (at 8pm, as you do). Frenchie came in and turned on the lights, disrupting me from my sleep. I remember being annoyed at him for doing so until he told me those words that would be forever etched in my memory "il y avait des attentats à Paris, il y a une centaine d'otages" - "there have been terrorist attacks in Paris, they've taken 100 hostages". My heart sank. I immediately jumped out of bed. That night, we sat together on the couch until 4am, unable to go to sleep, glued to the television, shocked, angry, speechless. Unable to understand what had happened, unable to comprehend why it had happened, the way it had happened, WHY THE HELL it had happened. My phone was going nuts. My Mum felt as though she was living a déjà vu as I was in London during the time of the London bombings in 2005. There she was, ten years later, again trying frantically to get hold of me. Friends and family around the world were starting to find out. I was receiving calls and messages non-stop, left, right and centre. People I hadn't been in touch with for months, for years were reaching out to see if I was okay. I felt so moved they thought of me. I couldn't keep up with the notifications and replies. I saw Facebook's safety check and activated it. And I remember sitting there for a moment, my eyes fixed onto the screen of my iPhone, staring at the safety check confirmation. I had just activated Facebook's safety check I thought to myself. Not because of a flood or an earthquake or some unavoidable natural disaster that had hit while I was trekking in an isolated dangerous jungle. I had activated Facebook's safety check to let my friends and family know that I hadn't been shot by a terrorist while having a drink or dinner in a restaurant or bar in Paris. What was this world coming to..? Unlike myself who was fast asleep, Frenchie and his daughter actually heard the suicide bombers explode directly on TV, it was live streaming after all. They remember looking at each other uneasily when they noticed the players' reactions after the second explosion. Something wasn't quite right but neither of them suspected anything until the news flash interrupted the coverage and two and two were finally put together. I had a friend who was running for her life on that Friday night. She was at Le Carillon when she heard gun shots and started to run, only to realise she was running in the wrong direction towards another shooting at rue la Fontaine au Roi. The worst thing was that her two children were at home and she was unable to get back to them until the next day because the city was in lock down mode with terrorists on the loose. A person at work had a friend who was eating at one of the restaurants that was targeted that night. She went home early because of a stomach ache, a stomach ache that would eventually save her life. Her cousin who stayed on at the dinner wasn't so lucky. She never got to go home that night. Another friend knew a girl whose partner was at the Bataclan concert hall. He was one of the 89 killed at Bataclan. One of the bodies that lay there while their mobile phones rang for the rest of the night. I cannot begin to imagine what it was like for the paramedics that night hearing the constant ringing of mobile phones of loved ones trying to track down their brothers, sisters, husbands, wives, sons, daughters and friends. Over the weekend we didn't leave the apartment. We wanted to respect the official advice and not to get in the way of forensics and police so they could do their job. I think I read the whole Internet that weekend. I read and read and read and read. I researched who ISIS where, what their objectives were, what they wanted to achieve. I researched what cracks existed in French society and French families that would lead to French born citizens making the choice to cold-bloodedly kill their unarmed innocent fellow citizens without even flinching. I read and read and didn't sleep that weekend. By Monday morning I had to take public transport to get to work. I sat on the metro whatsapping my Mum and Dad telling them I loved them. I sent them photos of my brave face, reassuring that everything was okay and that I was going to lie low for the next few days. But I was nervous as anything. Unlike Frenchie who would drive to work, stay there all day then drive home, I had to work at several places in Paris which meant 4-5 RER/metro trips a day, multiple entries into public spaces with security checks (which I didn't mind) and multiple entries into public spaces without security checks (which I did mind). I remember feeling the air of unease on the metro. We were on edge, eyes scanning our fellow passengers in the carriage and jumping at any sudden movements. When I stepped onto the platform at Opera metro station, I remember hearing a busker performing Ave Maria that Monday morning. I don't know why but I started to cry and incoherently babbled "merci monsieur" to him as I left a euro in his can. Tuesday came around and I was finally able to relax a little. People were easing up. More importantly, I was easing up. Then came Wednesday morning. Police had raided an apartment and uncovered a second operation due to take place at Roissy airport (Charles de Gaulle airport) and La Defense, the financial district of Paris that week. The two places I would be travelling to that week. I froze when I heard the news thinking, this isn't over yet. It's only the beginning. However on Thursday something changed inside of me. I had gone through the whole cycle, the whole roller coaster of emotions. I had been shocked, scared, angry, frightened, overwhelmed and moved. I had been nervous, anxious, sad, disheartened and disappointed. And then somehow that night was different. I had reached a certain degree of acceptance. I accepted that this would be the current situation in France. I accepted that trains were going to be late, cancelled and cleared while every suspicious package was dealt with caution. I accepted that that this may continue to be the situation in France for a while, a possible threat, a possible alarm. That we cannot entirely eliminate the root of the problem. That the issue at hand is much more complex than what the bombing in Syria might 'fix'. That if we were to address this issue at hand, results may not be seen until generations upon generations later. And I accepted that France was doing everything in its power to prevent this situation from ever occurring again. 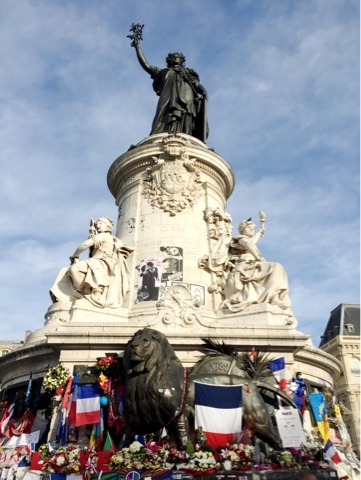 2000 raids and 210 arrests later along with markedly increased military police presence in Paris, I feel relatively 'safer' now than four weeks ago. 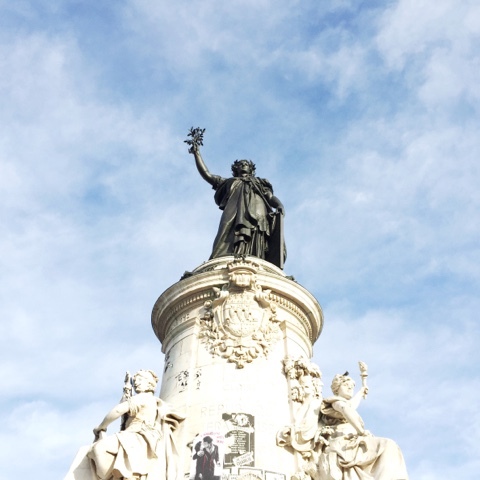 I visited Place de la République the other day to see all the tributes paid to the 130 victims of the Paris attacks. As expected, I became overwhelmed with emotion reading messages people had left for loved ones they had lost during the attacks. I thought about those who had written the messages. I thought about those who had 'survived' the attacks. I thought about the 368 injured victims were still living with the wounds from the attacks. I am a different person now after the Paris attacks. I am more alert and cautious of my surroundings yet I have made a conscious decision not to be paralysed by it. In fact, if anything, I am now more connected and focused in the present. I am making more plans to live in the now, to put down my iPhone and turn off the TV. To contact my family and friends who aren't in Paris and play a more active part in their lives, especially to those who were so concerned about my well being, bombarding me with notifications asking how I was. To see my friends here and spend time with Frenchie out, at night, in Paris, as we should have every right to. Heck for those of you who know me, I even made an exception and ordered a charcuterie platter tonight, against the recent WHO guidelines regarding processed meat being carcinogenic. The silver lining with these types of events is that you come to a realisation that there isn't much you can do about it. You can't simply stop living, even if you wanted to. So my take home message over the last four weeks is that if it's your time to go, it's your time to go. 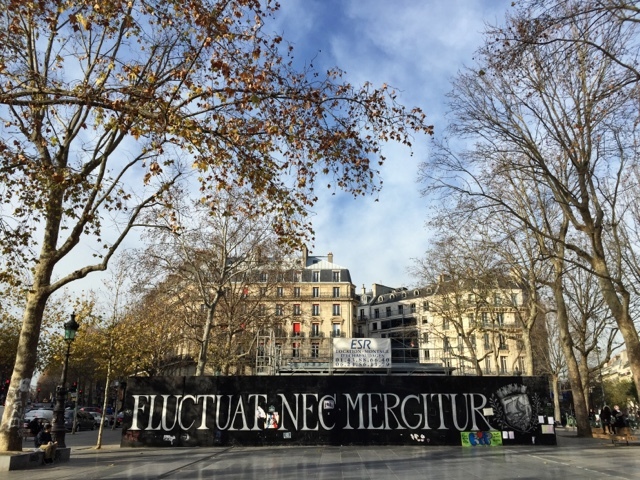 Like the Latin phrase that makes up the Paris coat of arms "Fluctuat nec mergitur" - Paris will be tossed by the waves but not sink. "Elle est agitée par les vagues, elle ne sombre pas". And neither will we. We can be tossed by the waves like Paris was, but we will not sink. 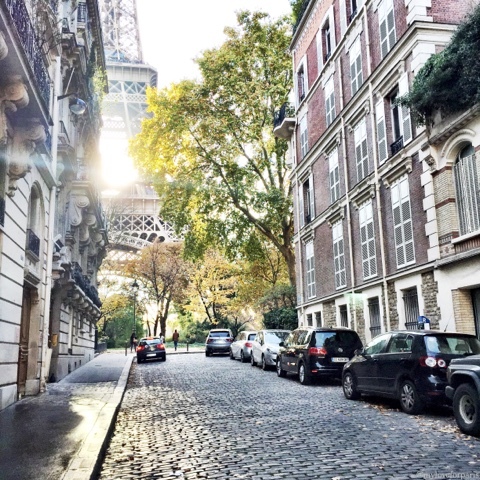 We will keep on floating and sailing and we will keep on experiencing all the beauty and life and light that Paris has to offer. Because we can, because we will, because we must.